I have been sending pups home steadily for the last few weeks. I have met some incredibly nice people and my puppies and I are both simply blessed! 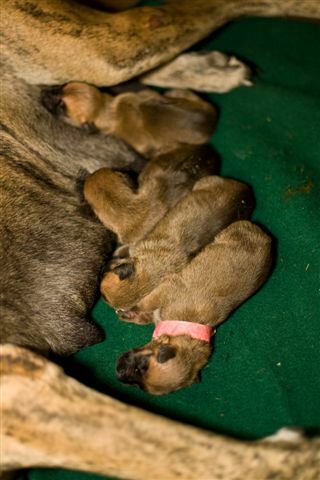 The pups have grown like little weeds, Jez’s pups top off at about 30# and Hannah’s littles are getting up there too. My two Kitchen Littles are doing well – BB, the boy, went home to MO, to a wonderful family – mom and daughter have had Danes for over 20 yrs and mom was lonely – she got BB the day before her 70th bday and loves him dearly. The downside is his leg rather than getting better is getting worse and so they are off to Columbia U to the vet school there to get help. BB has such a amazing spirit I simply keep praying that all will be well. The little girl,Sandy (Miss Congeniality – thanks Jen!) is still home and I am seriously thinking she will stay but she is doing well and of course still incredibly sassy! The rest of the crew here are doing well – the girls are settled back into the regular routines and Ben finally will get some rest – girls in heat drive him, Beau & Gunner nuts and I am happy to have some quiet. The Wheaten babies are it until the end of the year so I will be working on getting the wild bunch trained, hitting the road for some shows and work on my grooming skills in my puppy house/grooming shed – as soon as John gets my big mirror up!! I start my new job on Monday and will start to settle into a new schedule. I am happy to have this new door open and look forward to the challenge. I will have several new galleries so you don’t have to dig all through them to see everything! We have our first Wheaten puppies!! The babies are finally here! John has been so excited and Sile almost delivered the pups on his side of the bed, inches from his head!! 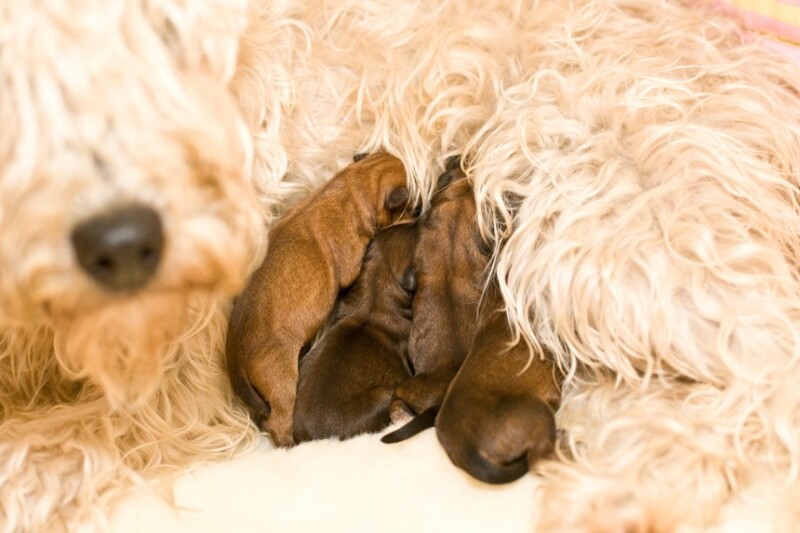 Quick action on my part had Sile in the bathroom in a flash and the first pup – in fact all of them were delivered in my bathroom! Sile, is now all set up in her puppy pen with her custom covers and they are cosy and comfy and doing wonderfully!! Sile ( that is Sheila for those that are wondering) is due March 1. Today we went to the vet for xrays to count heads and we have a count of FIVE!! Needless to say we are very excited! Towards the end of the week I will set up my larger puppy pen, bring down the whelping pads – I had 3 custom made for her and they are sooo cute. John loves his Sile and he is so very excited to finally have his first wheaten litter. 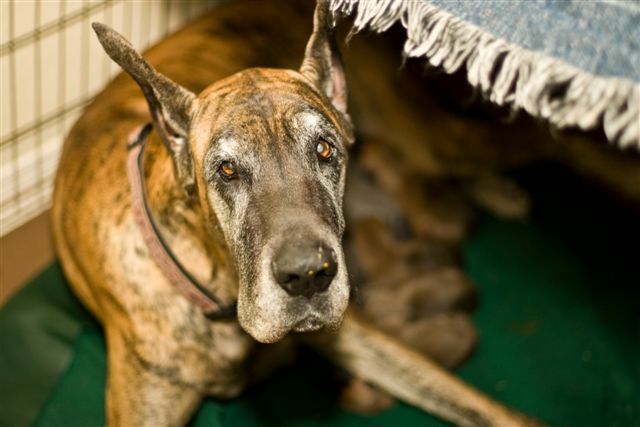 Beau the daddy to the litter is such a sweetheart that we are certain that the litter will be a bunch of love bugs! It is supposed to rain tomorrow but if I get a break I will try and get some pictures. I am thinking to move all the littles to one puppy house and move the moms out to their girlfriends and simply make the big weaning break but I am not sure, we may drag it out a bit longer. Hannah and Reeda have been out running with the other girls daily for a few hours but are always ready to get back to their kids, so they may well put a kink in my plans. We will see how it goes! Finally!! The littles are loading so likely the Bigs will be loaded in the am. We had a lovely day today, warm,sunny and simply perfect! I am still busy!! I am starting to wean the Littles, they are eating 3 non-mom meals a day, the Bigs are now eating regular food with water – they have moved up from ground with formula, to soaked with watered down formula to regular with water!! My two littles in the kitchen are doing well the boy, who I am calling BB – Big Boy,Bad Boy, Belly Boy….acts as though he is completely recovered from his hernia repair, stitches come out Monday and he gets to go back and hang out with the rest of the litter again. My little girl, with the hurt shoulder, luckily was an infection from whether a toenail or an inadvertant tooth we will never know but she is doing much better though still not 100%. She is eating great, she hears me and starts fussing , she is a butterball. I am going to start physical therapy with her – in the kitchen sink,swimming…I have been thinking who has a warm pool at this time of year and truly I can’t think of anyone and I think a hot tub may well be too warm?? so the sink it is! We are expecting more rain this weekend, so my goal today is to get some pictures for you guys! Valentines was lovely – the boys gave me flowers, one orchid and two potted flowers, I gave John a new Satsuma tree, we haven’t planted any here and had two at our last house and are need of our own oranges!! The boys of course recieved candy and cards and we had a lovely dinner at home!! Today my mom and I are having a Valentines lunch! With that, I must run, I have babies to feed and places to clean up! Oh! lets start getting some name themes in – we don’t have much time!! I am typing with a “little” in my lap and she growls when I move her – she does not like being alone and so I carry her alot, I am tossing about hor to make a sling that I could carry her in and her not fall out on her head?? – ideas are appreciated, I am still in my pj’s,have fed my two pups in the kitchen puppy ccu(critical care unit :-)) both are doing well, just takes time when pups get off track sometimes. I have new pics of the ‘Bigs’ up and the ‘Littles’ are loading as I type – the littles are inside and the light stinks and to be honest to sit and post process takes more time than I have so we have what we have…they seem to enjoy eating though and every day they are getting bigger. The weather here in Texas is phenomenal…beautiful, blue skies, warm days, cool nights, so the dogs and all of us are loving it! John drove to Missouri with our youngest son to see a doctor that is doing a study on the mesh used in hernia repairs and the problems caused by it, we have chased dr’s with his problems for the last 8 -9 yrs each time asking about the hernia repair ,the mesh and the tacks and the possibilities that John’s health issues are tied to that. The Mayo clinic did conclude that we were right several years ago but said nothing could be done…which I refused to accept. So we kept digging and found this study – started in April and the goal is to prove to the MEDICAL COMMUNITY that there is a problem! Wow what a concept…off my rant …anyhoo – John drove up,met the dr – I had sent 9# of medical records up before him and they feel that they can help! Thank God!! So he will go back the end of April for surgery. I had gone to the job fair interviewed for a pretty cool job on a new unit, the only one of its kind in Houston and was called back for a second interview and yesterday got the call that they wanted me!! I will orient on days then go to nights, which I have not done in 20 yrs or so…but it is a wonderful opportunity and I simply can’t pass it up! I am amazed that God works so quickly. I was so concerned that the time out of ‘real’ nursing would be a detriment to getting hired and this unit is a medical surgical/psych unit! So my experience of the last 14 years will be put to good use and I will be ‘refreshed’ in all the things that I have forgotten while getting paid!! Yahoo!! Best yet I don’t have to start until mid March! K, that is enough chatting for now, I have chores waiting on me, the puppies need breakfast, and I plan to groom Sile today – which btw – she looks like she is pregnant and HUNGRY?? all the time!! We have , of course been busy, nothing new and unusual. I had a lovely scare with two of the puppies and spent the weekend worrying over them – luckily all is well but I still worry. I don’t have the little,little babies pics – but I am trying and I hope that counts 🙂 . The little fawn in the pic with the BlueBerry is Kalena del Piccolo Jigo, our new little Italian princess. She has come as a cooperative effort from her breeders in the hopes to one day send back Kalena babies to do us proud in Italy. 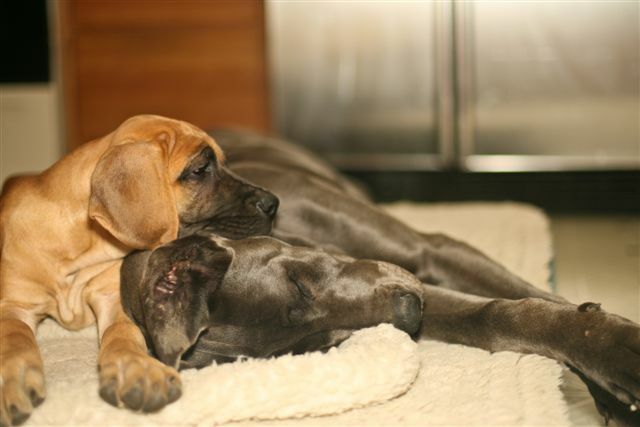 She is a wonderful puppy, beautiful, confident and pretty much every thing I could wish for in a Dane puppy and I am very pleased and proud to have her. I am off to a job fair tomorrow – my first and truly kind of scary – so think positive thoughts for me! but I am swamped! Reeda and Hannah are doing fine but I am still supplementing the pups…so my day starts with me taking dogs out,then going out and feeding the ‘littles’ – Elvis,Celine and Hallie – then the big dogs and the mamas, then it is time to give bottles and make the puppy gruel for Jezzie’s babies. Out by Jez, I clean up and change out the floor mats, make sure everyone eats enough, clean up again and out again to come back inside do some house chores and get ready for lunch bottles… in between I try to get laundry done, get dinner together, run an errand or two and get back to start evening chores! I sat down to dinner tonight at 8pm, after dishes and putting it all away it was 9pm. Tomorrow I hope to move Reeda out of my kitchen into the new puppy house so I am dashing about all over the place, and after that I am off to the airport y 1pm- oh yeah I got to get all the stuff out of the truck to cram more stuff in it and go to the airport too – all before noon with my morning chores all done too! So I am hoping you guys see why it is highly unlikely that I will have pics and video before Monday. Saturday I need to go get my patient’s cats and get them re-homed, one is going to my sister the other two will go to a friend as a foster home until I find someplace for the two of them – oh yeah and I will be toting my 18mon old grandson with me on Saturday too. Does it sound like I am whining? 🙂 I am NOT,NOT,NOT 🙂 But I am busy, the following week Hannah’s babies will be out of the period where I truly worry – the first two weeks is so very crucial to babies and I truly hope I have a tad bit more time, though I need to find a job somewhere in the very near future! Pics will be coming soon but it won’t be in the next few days! Hang in there I promise I will have them as soon as I can!